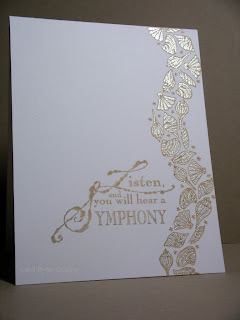 I am really enjoying the weekly Wednesday challenges Susan is posting over at her blog, Simplicity. Each Wednesday I look at her new challenge and then promptly think, 'hmmmm, wonder if I can come up with anything to qualify for the challenge this week.' Well, this week it was a bonanza! Lots of ideas after rummaging around the stamp drawers. First up is the water border by Meer Image (don't think they are around anymore...it's a pretty old stamp). Used my stamp-a-ma-jig to repeatedly stamp the water in the yummy Bahama Breeze memento ink. Sailboat and sentiment are from A Muse and the sun is from Inkadinkadoo. For the second card, I used another old, old swirly image by Stampin Up! 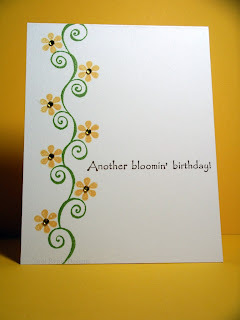 The swirls were highlighted with a flower from an Inkadinkadoo clear set and a little bling. The sentiment is by Make an Impression. 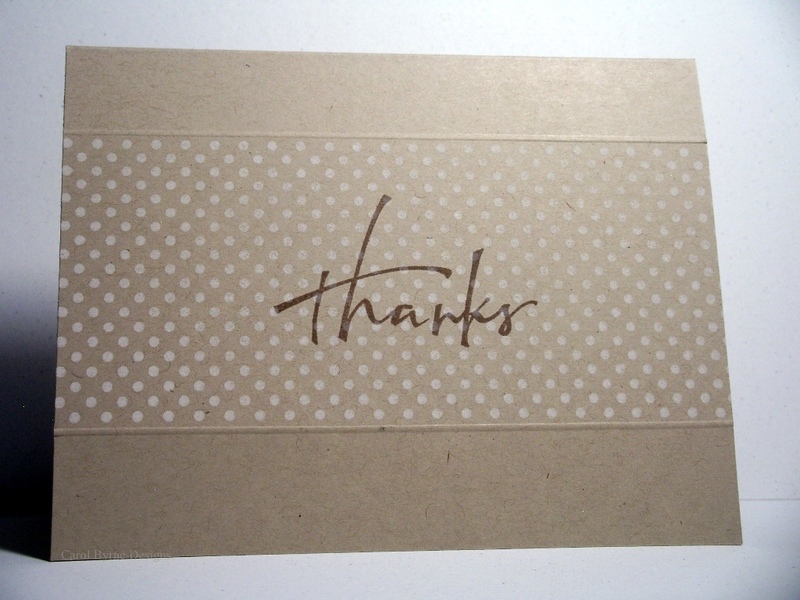 Third, I used the fabulous dot border stamp from Impress Rubber Stamps. It is truly one of my well loved stamps. The sentiment is from Stampabilities. Fourth, is a really neat text stamp that states "good-bye" in many different ways. 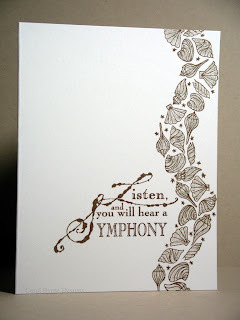 It is by Hampton Art and the sentiment is from Paper Salon. Fifth, is a really pretty border stamp of seashells by Impression Obsession. I wasn't sure which color ink to use or how to color them. So, I opted to stamp it twice....the first is in Memento Desert Sand and the second is in Memento Rich Cocoa. Both are colored in with a clear sakura glitter pen. I think I like the subtleness of the desert sand card. Sentiment also by I-O. 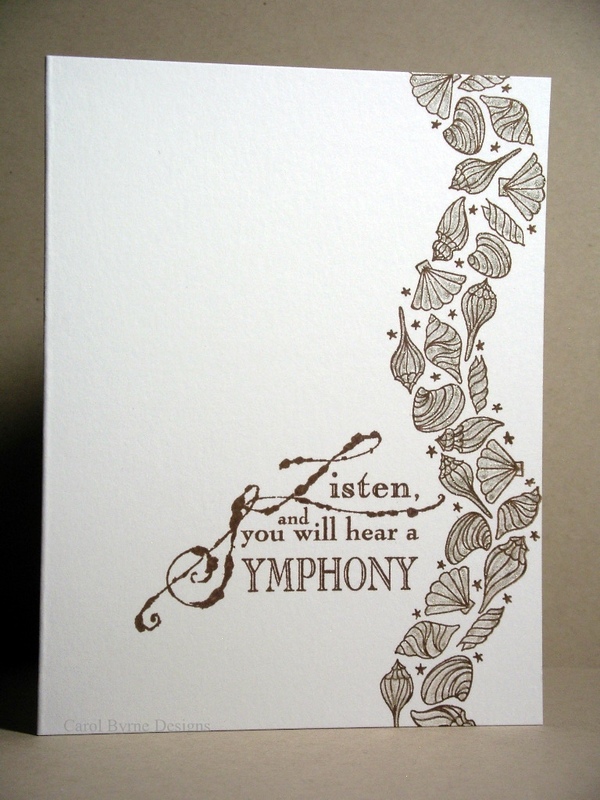 Sixth, is a variation of a card I make fairly often when I need a sympathy card, but I typically mat it. No matting this time, and it is not too shabby. Pardon the messy sentiment. I didn't get a very good impression, so I tried to doctor it up....too lazy to re-do the entire card.....had other cards to make! The ground is by Impress Rubber Stamps, the tree by SU, and the sentiment from PTI. 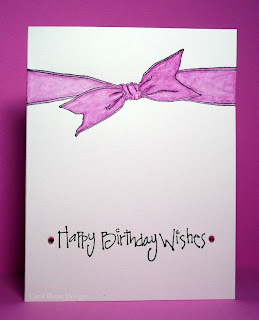 Lastly, I used my "ribbon" stamp by Impression Obsession on watercolor paper and used watercolor pencils and water to try to create a sheer type of ribbon. It's just ok. I consider it practice. And practice eventually leads to perfect. I hope. Sentiment is by Printworks. These are just delightful! 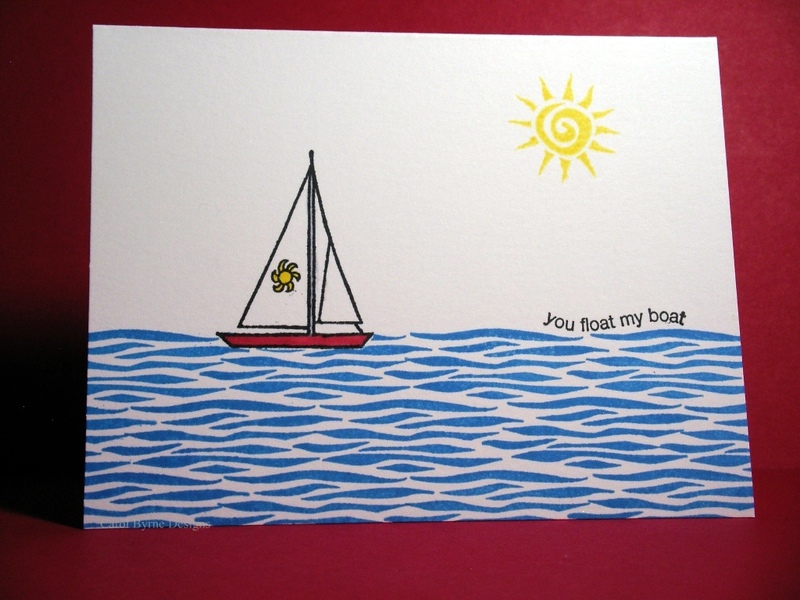 My favorites are the tree with the Impress Stamped ground and your A Muse sailboat in the water! Great job on the challenge!! wow! all your cards are amazing! i really like the one with the shell border... just beautiful! Carol, I love each and every one of these cards!!! I was trying to decide which card was my favorite and I finally narrowed it down to ...no actually I didn't narrow it down...I love them all!! Although...I really love the tree card...oh, and the card with the dot border. I would love to have that dot border! You really outdid yourself on this challenge! 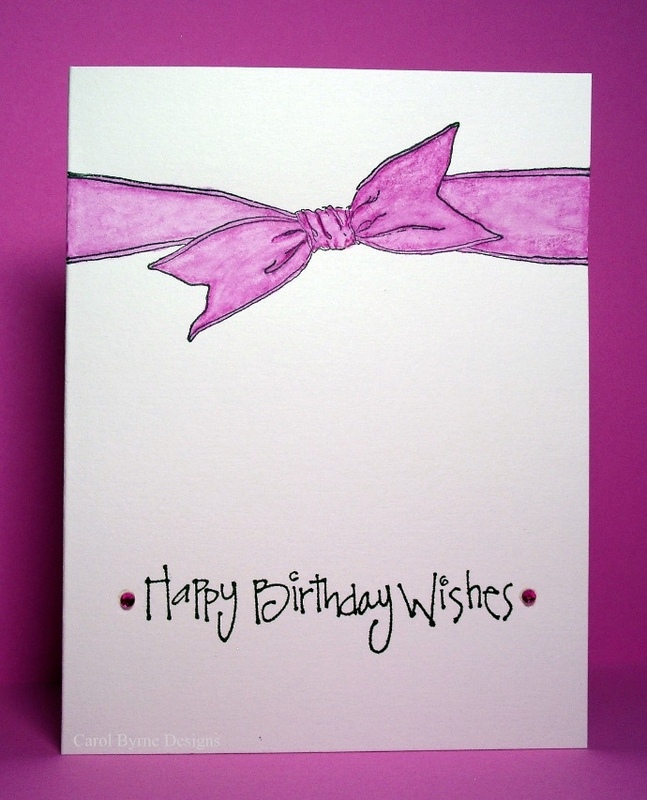 Awesome, fabulous cards!! I'm so glad you participated in the challenge. It was great to see all the cards, and I like every single one. I'm intrigued by how you made the water--so I guess my favorite is the first card. WOW!!! You've really outdone yourself with this challenge. I love every single card. wow look at you go!! I love them all but those sea shells are particularly beautiful and the swirls with flowers too!! Wow, what a bunch of fabulous cards! 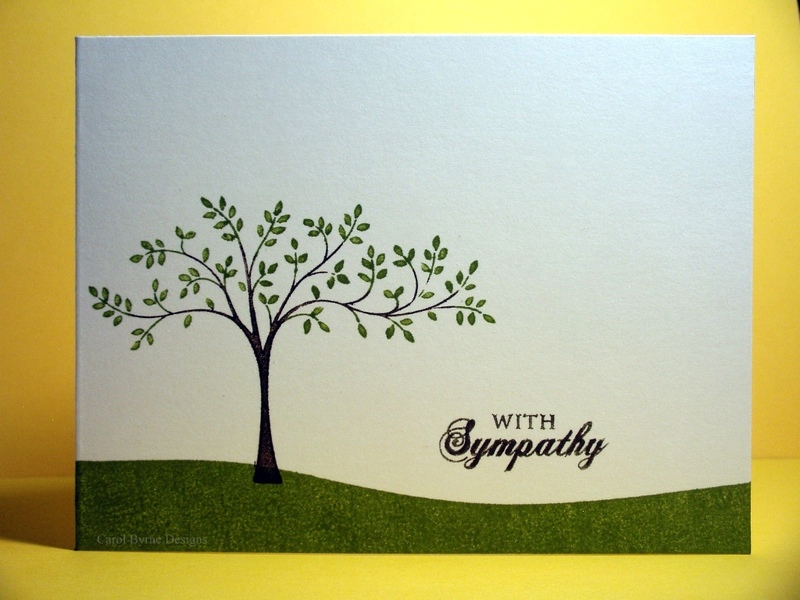 I love the boat on the water, and the sympathy tree, but all are fantastic. Thank you for giving us some great ideas! Loved them all. Couldn't choose just one. You really do well with these challenges. Keep it up and thanks for sharing. Hi there Carol, WoW !! 7 fantastic cards, did you get carried away or what? I love every single one but if I had to pick a favourite it would be 'Listen and you will hear a symphony' that is just brilliant! 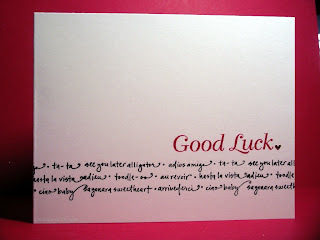 I am astounded at all your gorgeous cards, truly. I think my favorite is the first seashell one, so pretty.